A portrait of Eddie Lang, inscribed to Leo McConville. Courtesy of the McConville Archives. The caricature of such listeners is the people who wore out the Bix solo on the Whiteman SWEET SUE but left the rest of the record’s surface black and gleaming. But I have come to see how limiting that was. 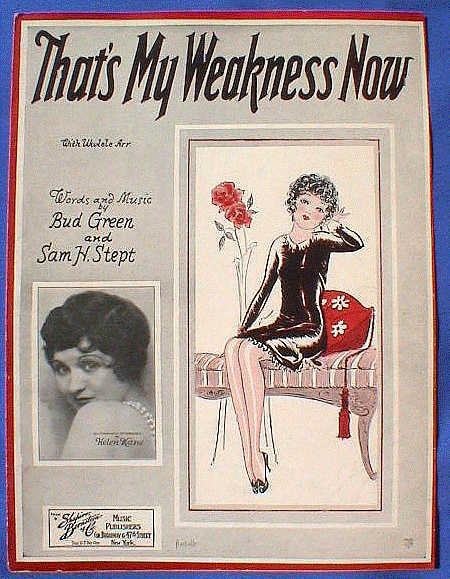 Consider this 1931 recording of a sweet pop song. It’s a Ben Selvin group, with a vocal by the demurely named Paul Small. This record (and the other side, WHAT IS IT?) finds no mention in a jazz discography, yet it is very satisfying music. For one thing, it is beautifully played — great dance music, wonderful strains to be holding one’s love, whether any apologies have been tendered or received in the recent past. The other reason is the deliciously subtle but pervasive guitar of Salvatore Massaro, “Eddie Lang” to the rest of us — who begins the side with an instantly recognizable introduction, and is audible behind the vocal and uplifting throughout. And they say men don’t know how to apologize. What wonderful music, what danceable tenderness. A good band is not hard to find in New York City. One of the places I rely on is Fraunces Tavern at 54 Pearl Street for their Saturday jazz brunch (1-4) usually led by Emily Asher with her delightful small band that is the Garden Party Quartet. Emily was on the road on May 7, 2016, but the joy continued unabated. String bassist and band-wizard Rob Adkins assembled a wonderfully melodic quartet: himself, Chris Flory, guitar; Dan Block, clarinet and tenor saxophone; Evan Arntzen, clarinet and alto. Oh, did they fill the room with good sounds! On to happier matters. This little ad-hoc band is not only composed of four wonderful soloists, but these players know the sacred value of ensemble playing — so lines intertwine, there’s counterpoint, riffs, backgrounds: all the collective joy one could ever hear. I present these performances in the order they happened, as is my habit. I think they are each small complete masterpieces, to be savored rather than gobbled. I hope you agree. There’s more to come. Please find a way to support the music if you want it to continue. That means going to a place where it is played, purchasing food and drink there, putting money in the tip jar, buying a CD from a musician . . . active rather than passive. Very little is actually free in this world, the title of the third song notwithstanding. And as a final irony, the people in this scene who are sitting at the bar, talking and drinking whiskey, are doing more by their presence to support the music they are ignoring than the most devoted “jazz fan” who lives solely off the Hot Internet. Aside from being one of the most handsome men in jazz, and a gloriously consistent soloist, Buck Clayton was also a splendid arranger and composer. In his hands, an apparently simple blues line had its own frolicsome Basie flavor, and his compositions take simple, logical, playful ideas and connect them irresistibly. Here’s a winning example — a blues from 1961 or earlier, from the period when Buck and his Basie colleagues (sometimes Emmett Berry, Dicky Wells, Earle Warren, Gene Ramey, and others) toured Europe and the United States, teaching and re-reaching everyone how to swing, how to solo effectively and concisely, and how to play as a unit. Such nice things as this — a spontaneous Buck Clayton evocation (thanks to Rossano Sportiello) happen as a matter of course at the Cleveland Classic Jazz Party (held this year September 15-18). OUTER DRIVE is performed by Duke Heitger, trumpet; Scott Robinson, tenor saxophone; Rossano Sportiello, piano; Nicki Parrott, string bass; Ricky Malichi, drums. Please, on your second or third listening, notice the variety of ensemble textures — how well five musicians who understand the swing tradition can and do sound like an orchestra, and how they intuitively construct riffs and backgrounds to keep the presentation lively. Steve Pistorius is an irreplaceable pianist, singer, bandleader, and visionary, and I love his Quartet — with a front line of Orange Kellin, clarinet; James Evans, vocal, reeds, and someone adept keeping time and swinging out the root notes — on this most recent occasion, Tom Saunders on bass sax. The Quartet doesn’t strive to imitate anyone in particular, but what comes out is deep and swinging. You could call it New Orleans jazz and not be wrong, but I think of it as four kindred souls having a sweetly intense conversation about the song at hand, where their intelligence and feeling raise up every note from what could be formulaic or prosaic. Here is what I wrote about their first disc, NEW ORLEANS SHUFFLE. To read what I wrote about their second, UNDER A CREOLE MOON, you’ll have to buy the disc — which I’ll predict you would want to anyway. Now, this isn’t an advertisement for those two compact discs (although the subliminal energy is in my words, I hope) but a gift of music — a session on the Steamboat NATCHEZ recorded [by me, for you] during the 2015 Steamboat Stomp. A cinematographic caveat follows. I was shooting into bright sunlight through large glass windows, so there was a good deal of unsolicited glare. Changing the videos to black and white helped cut down on the lurid aspect, but the four players are individually and collectively sheathed in what looks like swing ectoplasm. Fitting, of course. The sound, however, is fine and finer. Hot, intent, relaxed, soothing, compelling. The best in their line. And somewhere in these videos Steve says ruefully that this band has lost its regular gig. I find that astonishing — in New Orleans, so proud of its music? — that I hope it has been remedied by now. Club-owners and party-givers, take note. And I will keep you informed about the 2016 Steamboat Stomp — something I hope to attend. A regular attraction was the Wednesday night band — a compact unit led by banjoist / singer / composer Eddy Davis, and dubbed by him late in its run WILD REEDS AND WICKED RHYTHM. Most often, the instrumentation was Conal Fowkes, string bass; Scott Robinson, C-melody saxophone; Orange Kellin, clarinet, and Eddy — four players with a strong lyrical streak who could also make a bandstand seem wildly hot in the tradition of the Bechet-Spanier Big Four or Soprano Summit on an uptempo outchorus. Since the regular Wednesday night gig ended, this band has gotten together for musical reunions — although not as often as its fans and partisans would like. Thus, I was thrilled to learn that Eddy, Conal, Orange, and Scott would be “the EarRegulars” on Sunday, June 3, 2012, at The Ear Inn. And I present some of the frankly magical results herein. Eddy would not be insulted, I think, if I called his approach “quirky,” and his whimsical view of the musical spectrum colors and uplifts the band. Another leader might have stuck to the predictable dozen “New Orleans” or “trad” standards, but not Eddy. His musical range, affections, and knowledge are broad — he approaches old songs in new ways and digs up “new” ones that get in the groove deeply. He knows how to set rocking tempos and his colleagues look both happy and inspired. In addition, Eddy writes lyrics — homespun rather than sleek — for some classic jazz tunes, and he sings them from the heart. All of these virtues were on display at The Ear Inn — friendly, jostling, witty solos and ensembles, and performances that took their time to scrape the clouds. P.S. This session happened in the beginning of June and has only emerged three months later — no reflection on the splendid heartfelt music, but because of some small technical difficulties . . . now happily repaired. 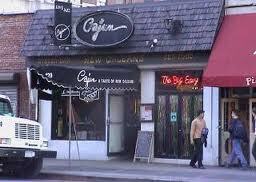 *At the end of July 2006, The Cajun closed after a twenty-eight year run — to make way for a faceless high-rise apartment building. When I find myself on Eighth Avenue and Sixteenth Street, I try not to search the spot where it once was. It was a flawed paradise, but we miss it. ENSEMBLE JOYS: “SAY ‘SI SI'”! The New Orleans musicians — even the ones who took expansive solos as the nature of jazz changed — knew how important inspired ensemble playing was. It would have been very bad form to cut short a romping group effort and simply dilute its force into a series of solos with the rhythm section. And this principle is perfectly demonstrated by a recent performance by Clint Baker and the Cafe Borrone All-Stars (captured on August 13, 2010, by the unwearying Rae Ann Berry) of the pop song “SAY ‘SI SI'” where for nearly five minutes the front line keeps a splendid momentum going. Just try and keep sedately still while this video is playing . . . !